Lt. Gen. Lewis B. Craparotta, commanding officer of I Marine Expeditionary Force, briefs senior Navy and Marine Corps leaders from throughout I MEF at a seminar to commence the Navy-Marine Corps Relief Society annual Active Duty Fund Drive at Camp Pendleton, Calif., March 13, 2018. US Marine Corps photo. The Pentagon announced several nominations for key Marine Corps and joint positions. Secretary of Defense James Mattis nominated Lt. Gen. Lewis Craparotta to serve as the next commander of U.S. Marine Corps Forces Pacific and Fleet Marine Corps Forces Pacific. Craparotta currently serves as the commanding general of I Marine Expeditionary Force (I MEF), which provides deployable Marine Air Ground Task Force (MAGTF) forces out of San Diego. Craparotta was commissioned in May 1983 and has commanded forces in Iraq and Afghanistan, served as director of operations at U.S. Northern Command, and commanded the Marine Air Ground Task Force (MAGTF) Training Command and Marine Corps Air Ground Combat Center. U.S. Marine Corps Maj. Gen. Eric Smith, the commanding general of 1st Marine Division, addresses members of The Nice Guys charity organization, during a weapons demonstration at Marine Corps Base Camp Pendleton, Calif., Jan. 16, 2018. US Marine Corps photo. Mattis also nominated Maj. Gen. Eric Smith to serve as the next commander of III Marine Expeditionary Force and U.S. Marine Corps Forces Japan. In this position he would oversee Marine forces in the Western Pacific, including the 3rd Marine Division and 31st Marine Expeditionary Unit out of Japan. 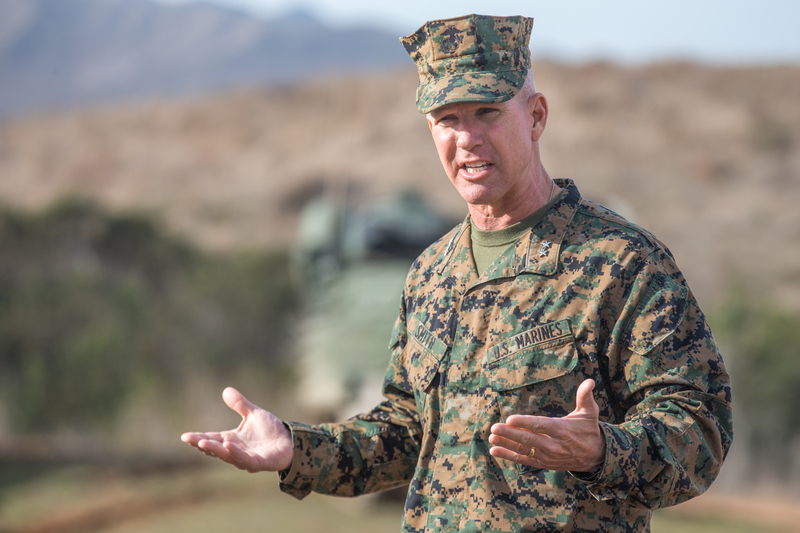 Smith currently serves as the commanding general of 1st Marine Division in San Diego. 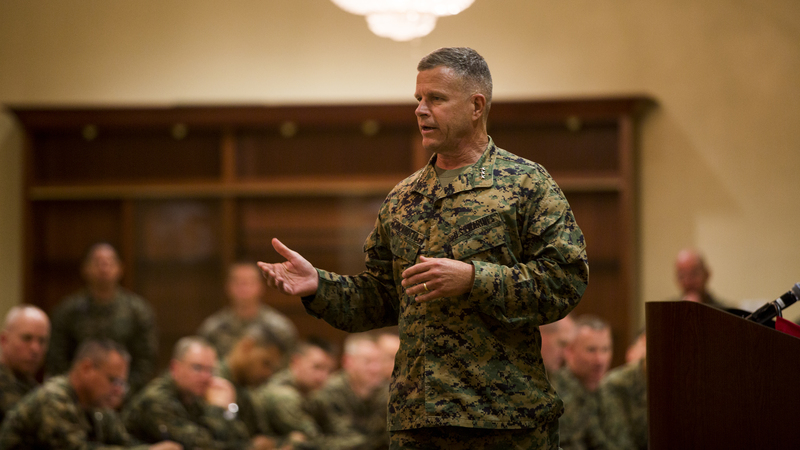 Smith has served in the Marine Corps since 1987 and in recent years has served as Director of Capability Development, Senior Military Assistant to the Deputy Secretary of Defense, commander of Marine Corps Forces Southern Command, and Assistant Deputy Commandant for Plans, Policies and Operations. 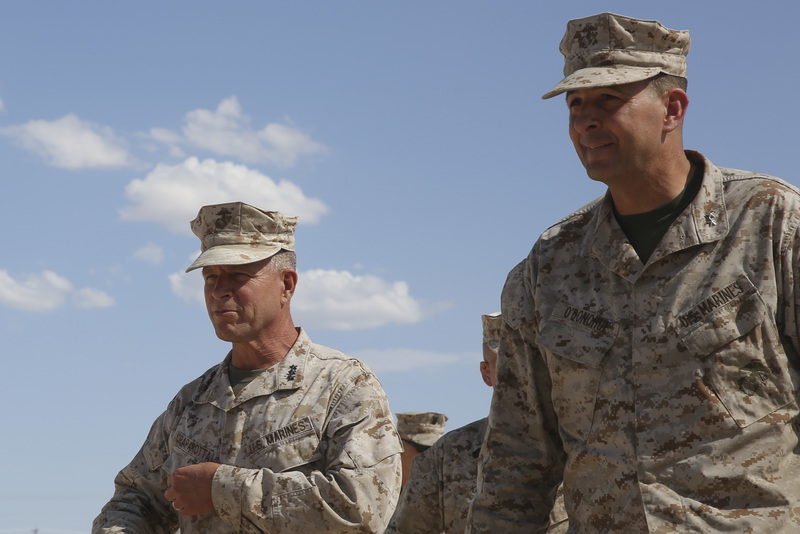 Lt. Gen. Lewis Craparotta, 1 Marine Expeditionary Force commanding general, left, and Maj. Gen. Daniel O’Donohue, 1st Marine Division commanding general, right, during Large Scale Exercise 2016 at Camp Wilson, Marine Corps Air-Ground Combat Center Twentynine Palms, Calif., Aug. 18, 2016. US Marine Corps photo. Mattis also nominated Lt. Gen. Daniel O’Donohue to serve as the next director of J-7 on the Joint Staff, overseeing all joint force development to include doctrine, education, training, exercises, and concept development and experimentation. O’Donohue currently serves as the deputy commandant of the Marine Corps for information. O’Donohue was commissioned in 1984 and has served as the director of the Marine Corps’ Capabilities Development Directorate, deputy director for force management at the Joint Staff (J-8), deputy chief of staff for operations at the International Security Assistance Force (ISAF) Joint Command in Afghanistan, commander of Marine Corps Forces Cyberspace Command and commander of 1st Marine Division. Vice Adm. Mike Gilday, left, commander, U.S. Fleet Cyber Command/U.S. 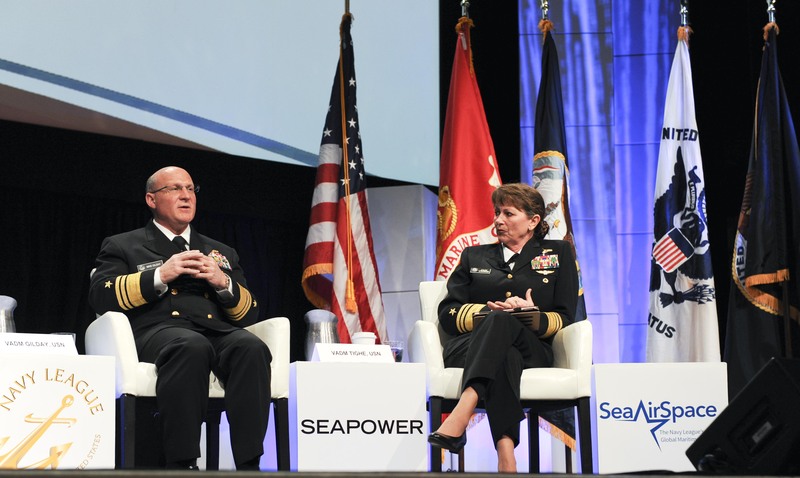 10th Fleet, answers a question from Vice Adm. Jan Tighe, deputy chief of naval operations for Information Warfare and director of naval intelligence, during the Cyber Operations in Sea Services panel held at the 2017 Sea-Air-Space Exposition. US Navy photo. Mattis also nominated Vice Adm. Michael Gilday to serve as the director for operations (J-3) on the Joint Staff. Gilday currently serves as the commander of U.S. Fleet Cyber Command and commander of U.S. 10th Fleet. Gilday is a surface warfare officer who graduated from the U.S. Naval Academy in 1985. He commanded destroyer USS Higgins (DDG-76) during the initial combat operations of Iraqi Freedom, USS Benfold (DDG-65), Destroyer Squadron (DESRON) 7 serving as sea combat commander for the Ronald Reagan Carrier Strike Group, and Carrier Strike Group 8 embarked on USS Dwight D. Eisenhower (CVN-69). Gilday also served as director of operations (J-3) for U.S. Cyber Command, and in July 2016 he took command of U.S. Fleet Cyber Command/U.S. 10th Fleet. Rear Adm. Timothy White was nominated by Mattis in February and confirmed by the Senate in March to serve as the next commander of Fleet Cyber Command/10th Fleet.